National Building Museum and Metropolis Magazine contributor Andrew Caruso takes you “inside the design mind” of three prominent figures in the 9/11 rebuilding process with this recent interview conducted at the 2012 AIA National Convention. Heroic. Contemplative. Grieving. Victorious. 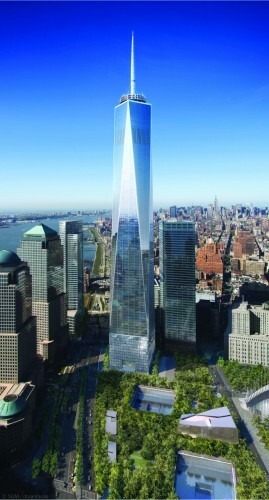 The rebirth of the former World Trade Center site in lower Manhattan has engendered significant public reaction and reflection. With implications as complex as they are profound, it is not surprising that it has taken more than a decade to heal the urban scars of September 11, 2001. I had the rare opportunity to sit down with three architects working on the site, Santiago Calatrava, David Childs, and Daniel Libeskind, at the recent American Institute of Architects convention in Washington, D.C., where they were honored along with four others, as “Architects of Healing.” We discussed their experience of reshaping one of the most culturally significant sites in the history of the United States. With this interview we begin a series of conversations, “Inside the Design Mind,” with key architects, exploring the motivations of today’s design icons and influencers. This initiative is part of the National Building Museum’s intention to tell the story of our time through architecture, engineering, and design. Andrew Caruso: What is it about architecture, perhaps distinct from other art forms, that promotes a healing process? Santiago Calatrava: I never thought about that, but we understand architecture as having a sense of permanence. Architecture mostly survives us. Whatever we build, we are conscious that it stays for the next generation. In terms of giving the sense of being remembered, architecture is very useful. Being remembered, in Latin, is the root of the word monument. So, the monument character [sic] of architecture has to do with passing an idea to the next generation. On one side architecture will preserve [this memory] to the next generation so that it never again happens; and on the other side, [the attitude] to rebuild, is also exemplar for the coming generation. From these two points you can see analytically the deep sense of the effort in lower Manhattan. David Childs: I’m not so sure I buy into that. Can you really describe sculpture being different from painting, from architecture? Over the past three or four decades there has been a merging of these disciplines. I think, in fact, these things have blurred. It’s so wonderful, the openness of it. Architecture can certainly [heal] in its own way, but so can poetry. Daniel Libeskind: Architecture promotes healing because it brings people together. It is literally the space of emotions and of our lives. There’s nothing abstract about architecture when it comes to healing. Yet it’s something also of dreams because architecture creates the perspective of orientation—of where you are, and of memory—at the same time. In that sense I think it’s the greatest instrument of healing that we have. Every urban context and building brings people into a social and contextual whole. That is the enigma and the power of architecture. Caruso: What new awareness did this specific project bring to you as a designer? Calatrava: As you hear in my accent, I am not American. But the tragedy of September 11 was not a local fact; it was a fact worldwide. The world after September 11—the day after—was different. On September 11, I never thought I would have been here today. To be part of those who have contributed, and I am just one part, I think is part of my destiny. Libeskind: I am a New Yorker, an immigrant to the city. That’s why I didn’t just rebuild the necessary buildings. I wanted to imbue the site with the spirit of what I believe New York to be. Though the buildings stand in a grid, they form a spiral open to the Hudson River, the great route of the immigrants. I wanted to imbue the site with the symbolism of light, which opens between 8:46am and 10:28am when the world changed; to be a memorial in light and a grand new civic space beyond the memorial itself. The 1776 height of the building—I didn’t’ care that it should be the tallest building in the world, but I wanted people to feel that the Declaration of Independence is connected to the bedrock at which people fell, and so too becomes part of the memorial. It’s an unprecedented project. You can’t foresee how emotional and complex such a project is. It’s a marathon and not a sprint. You have to have a lot of patience and cannot be swayed by all sorts of opinions and gossip generated around you. You learn many things that you could never learn from any place other than that experience. Caruso: Mr. Childs, you’ve done many skyscrapers before. 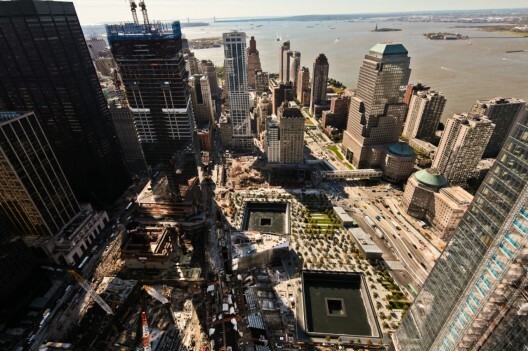 What was so different about 1 World Trade Center? Childs: Well, every building has its own challenges. This one had many technical challenges. It’s in a river, a big river. You have to go down 80 feet to bedrock to anchor it down. And, being a tall building, it’s another animal, so the slenderness ratio is very complicated. But there are a lot of [other] aspects that had to be accomplished. First of course was the symbolic: rebuilding the skyline. But we also took just as seriously advancing the art of architecture in terms of its safety. The skyscraper is really an American invention, but we lost the forefront. This was a wakeup call and enabled us to upgrade all sorts of codes in New York that have become models for other cities. Caruso: Mr. Calatrava, your practice has explored the incredible balance between beauty and performance in architecture. 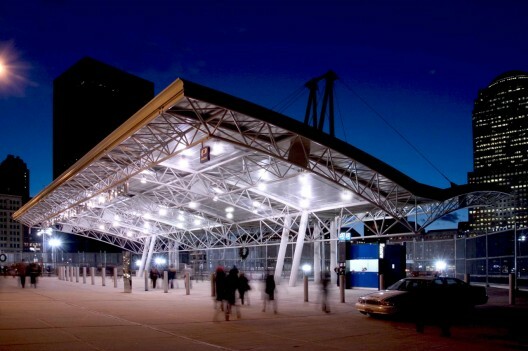 How did you extend the concept of balance to accommodate the emotions and physical requirements of the PATH station at Ground Zero? Calatrava: I’ve been involved in several railway stations, and I recognize they are basically functional. They have to work. They have to be easy to use, function twenty-four hours a day and are probably the most public buildings because everybody can enter and go out, no restriction, no limitation. But the stations also have something mystical. They are the gates; people come to cities and go out of cities through them. In the history of New York, enormous, interesting, and beautiful buildings have served for 100 years [now] ten times more people with the same infrastructure. We try to capture all of that and I think what uplifted our effort is the Port Authority, itself. They wanted to catch the spirit of the great buildings of New York. Without [their collaboration] the project would have been impossible. Caruso: Mr. Libeskind, you have worked very successfully as an architect of healing, most notably for the Jüdisches Museum, Berlin. What is it about these projects that draw you to them? Libeskind: I don’t know if I’m drawn to them, but these projects are not abstract to me; they are part of my own experience. Whether it is as somebody born to Holocaust survivors or someone who studied architecture in Europe when the Twin Towers were built, it’s not something that is remote. The response to it was an instant response. It came from the heart. Of course you have to support that response with a lot of technical and professional knowledge, but ultimately it’s about the human response and the values that I believe make New York a great city; a city of opportunity, freedom, liberty, talent, and a city where bigotry is not tolerated. As an immigrant, I feel that this is really the shaping of the site. That’s where I thought we have to bring the character of publicness [sic] to bear. Caruso: How do you measure success for this collective project? Calatrava: I cannot judge globally how much time we will need to reconstruct, but it is very important that the whole reconstruction happens. This is a key goal. We have to preserve this goal and not lose stamina or momentum. The success of this project will be measured in that we really achieved a goal that people put [to us] ten years ago. That is number one. Childs: Ten years ago, when everybody went down to the site they were looking down with frowns on their face. Now they look up and smile. People love to see things happening again and being replaced. I think [1 World Trade Center] has clearly made advances, from technical detailing of the window wall to green engineering, and so forth. And I think that people respond so positively to seeing that marker. [After September 11], you saw the tip of Manhattan and had no idea where the World Trade Center was. But now, there’s that vertical presence. There’s a nice dialogue now between downtown and midtown that was lost. We do have tall buildings downtown, but the connection is back again, sort of talking to each other like when the towers were there. Libeskind: Success is measured in how it brings together two almost irreconcilable aspects: the loss of those who perished on that tragic day and a force to rebuild the city in an affirmation of life. And I think those two things go together; they are not really opposites. One supports the other and that’s the beauty of the development of Ground Zero. It was not easy to achieve, but I wanted to touch the fullness of the experience of what happened there. And at the same time I wanted to create streets that are interesting and balance the need for retail and open to the memorial in a civic way. It is a complex equation of emotion and realism, and I think both are needed. That’s what New York has always been. Success is also measured in response to the needs of people. It’s not how tall the buildings are, it’s about the healing atmosphere that a space communicates. That is ineffable; it is not measurable on a scale of objective values. It is something deeply cultural and spiritual, and that’s what I would define as the civic art of architecture, the civic art of cities. It balances memory and tragedy, integrates it into life and moves life forward in a way that is full of joy and celebration. This is really the notion of living in an open and democratic city. Caruso: What do you think now when you step on the site? Libeskind: I’m inspired that all the things that were drawn are really underway and they look fantastic. And I can see people have smiles on their face and are suddenly coming back to the memorial. I see that energy coming back to this place as really interesting, civic, important and beautiful; something that I think will contribute to the future of a great city. About “Inside the Design Mind” Andrew Caruso , AIA, LEED AP BD+C, CDT, publishes and speaks internationally on issues of talent within the creative industries. His latest column, “Inside the Design Mind,” explores the motivations of today’s design icons and influencers, surfacing key elements of their identity and examining their agency within the community of practice. Andrew can be reached at: inquiries[at]andrewcaruso[dot]com. “Inside the Design Mind” is presented in partnership with the National Building Museum and Metropolis Magazine. This interview was originally published by the National Building Museum and Metropolis Magazine.